Day is a fugitive trying to save his family. June is a prodigy trying to avenger hers. Each stand in the way of the other accomplishing their goal. 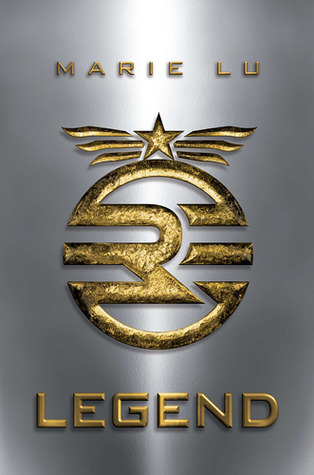 In Legend we are introduced to a world where the same President has been reelected so many times that no one can remember a different president. The nation is divided and the Republic and the Colonies are at war. 10-year-olds take a test that will decide their fate. Those who do badly end up in squallor. In communities ravaged by disease. Those who do best end up with vaccines and power. Or so they say. No one really knows. Day did the unthinkable. He failed the test. He has lived in teh shadows robbing from those who have to give to those who don't. Then one night, Day and June's paths converge. I don't know that the story feels entirely original, but it was well done. The story was told from the alternating point of views of Day and June. I loved Day most of all as his world was more intriguing. None of the characters were "good" or "bad," but fell something in between. Well most of them. They all had motives which led to some exciting tension. Like many dystopian novels, it is a darker read, but it isn't bleak like many. I love how both characters were fighters figuratively and literally. For all of June's prodigy status and her actions from early in the novel, I expected a bit more from her. I wasn't disappointed but I definitely hope to see much more in the future that aligns with the character I was first introduced to. I hated the romance. If it weren't for the romance, this would have been an awesome read for me. It wasn't bad. I just want to be clear. I just feel like it could have been done better. If you are going to have a romance in the middle of tragedy, death, torture, and betrayal, it's got to be so good that I forget that that's just not realistic or fun. Hints of love and attraction is okay, but a romance has to be sold in these situations. There were two narrators. One for June's chapters, and one for Day's chapters. I thought they both did a pretty good job, though I enjoyed Ms. Stern more. The only downside to having two narrators is that each narrator has a different voice for the other character. So if Ms. Stern is narrating as June, her voice for Day was very different from Mr. Kaplan's voice as Day. It wasn't too distracting but I thought it was an interesting choice. Please read this one in any version you can find. While the plot isn't earth shattering, it grabs you from the beginning to the end. Things are easy for the characters and tough choices have to be made. I love it when that happens. P.S. 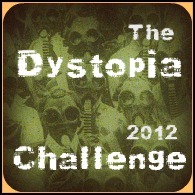 This goes toward that Dystopia challenge that I forgot that I committed to. I'm sure ya'll have noticed this trend popping up in these parts. It is so deliciously fun! P.P.S. I'm using the word "ya'll" because I'm feeling extra Texan today. I'm not quite sure why. I listened to this audio as well and I enjoyed it. I love when an audiobook has multiple narrators and I think that fact that this story was told in alternating POVs added so much. This was my first time listening to a book with two narrators. It was very different. There are so many to try right?! I loved this book a lot too! So glad to hear your September was a great reading month-mine was kind of the opposite with me finishing a lot of books when I should have just said DNF. I've had months like that as well, plus I avoid DNF books. YAY!! This is my favorite 2011 book! I'm o glad you liked it! :) Great review! As for your note at the top...the dystopian books and GOT books I've been reading has me feeling the same. As for the book, I've been wanting to pick this one up. I'm curious as to what exactly happens to June's brother and how it brings the two together. The secrets are killing me! So this is another dystopian to add to my list. PS: Why did I just write and schedule a post and surely used the word y'all. Country knows no bounds! I'm doing a lot of dystopian reading lately. It's been fun. Sounds like something I need to read for sure. I picked it up a time or two when it first published but never was sold on it. Nevertheless, since you liked it, it'll probably be a library read. I have a feeling I'd have the same reaction to the romance! I read a couple of reviews that loved it and a few that made me second-guess wanting to read it. But ultimately it was a great read. Yes! We should have a getting our groove back party! I haven't looked into the sequel yet. I need to go see what is coming. Yay!! I'm glad you are getting back into reading again :) I am not sure about this one b/c sometimes dystopian doesn't work for me, but I'm glad you loved it! I'm starting to think that enjoying dystopian depends on the order that you read them.